A terrific day filled with great energy, creating awareness and raising funds to support the Foundation. Many thanks to Karin Welsh for this video! You can also check out Cam's Kids Golf Tournament 2016 and more videos from Talking Crow Video on Vimeo. Over 140 golfers hit the links at this year's Cam's Kids 2nd Annual Golf Tournament and Dinner. 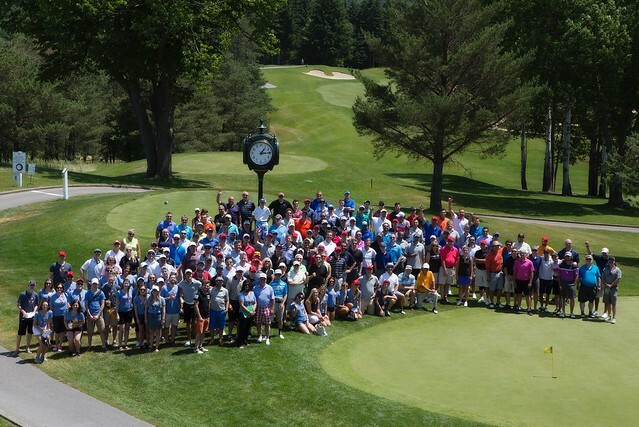 On Saturday, June 25th, participants arrived at Wooden Sticks Golf Course in Uxbridge, to support a wonderful cause on a beautiful sunny day. Supporters were greeted with Cam’s KidsT-shirts, backpacks and hats for their day on the course. Around 40 ambassadors and volunteers eagerly lent a hand wherever needed to keep the event running smoothly. From selling raffle tickets to overseeing the poker holes, the volunteers helped in the success of this year’s tournament. Following golf, 230 guests enjoyed a three-course meal, live auction, silent auction, followed by speeches and prize giveaways. This year’s sold-out tournament raised almost $65,000, which is an increase from last year. The tournament was not just an opportunity to play golf and raise money for a worthy cause; it opened the door for discussion about anxiety. Events like these help to create awareness and break the stigma surrounding anxiety and mental health. A big thank you goes out to Wooden Sticks for hosting this event, and their staff for helping to accommodate golfers, volunteers and dinner guests. Thank you to the many local businesses and families who showed their support by donating prizes for the raffles, auction, and winners. This event could not have been possible without the tireless efforts of all the volunteers, ambassadors, staff, donors and the support of the community and local businesses. Thank you to everyone who participated in Cam's Kids 2nd Annual Golf Tournament and Dinner.